Notrax® is one of the world's largest integrated manufacturers of floor matting. To maintain an industry leadership position over the course of 65-plus years, it takes much more than just world-class manufacturing. Notrax® truly differentiates itself from the competition when it comes to delivering the highest quality products on time, while remaining on the cutting edge of innovation to bring better products to market faster. We place a great deal of emphasis on product engineering, research & development and customer service. Saying Goodbye Can be Hard! It’s time to replace those beat-up and worn-out floor mats. Are your Mats damaged, double-stacked and improperly placed? 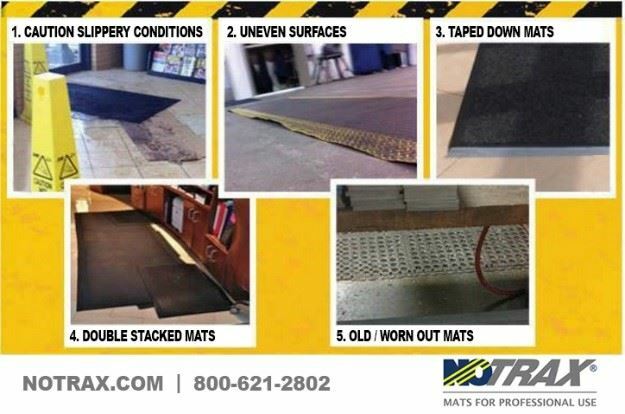 It’s time for a Notrax® Professional Mat replacement! Notrax® is now owned and operated by Checkers Safety Group. In this transition, APEX™ Food Service Products, AKRO® and HomeTrax Designs™ have all been rebranded under the Notrax® name. We believe that by marketing our products and services under one powerful brand will have a greater marketplace impact and will allow us to provide even more value to our customers. The rebranding strategy is part of our deliberate approach to not only expand our products, but to continue to improve and magnify our leadership position in the matting industry. Our new vision is to be a dynamic, global team dedicated to protecting people, assets and the environment and we will continue to be committed to providing revolutionary product designs and innovations that are in line with our solutions-oriented approach. Established in 1948 in Chicago, Illinois Superior Manufacturing Group, now known as Notrax®, was a modest manufacturing and repair shop for rubber entrance matting under the guidance of its founder, Charles Wood. Superior offered an assortment of floor matting brands including NoTrax®, Akro™, APEX™, and HomeTrax Designs™, that were used in a wide variety of markets for industrial, commercial, food service, and home applications. In 2015, Checkers Safety Group, formally known as Checkers Industrial Safety Products, acquired seven companies including Superior Manufacturing Group and generated four Power Brands. Notrax® has been declared as one of the four Power Brands along with Tufftrak® Ground Protection Solutions, Monster™ Motion Safety, and Linebacker® Cable Management. Since owned and operated by Checkers, Superior Manufacturing Group focused all four floor matting brands under the name Notrax® due to the long history of success therefore creating the name Notrax® – Mats for Professional Use. One of the things that sets us apart is that we manufacture our own products in ISO certified facilities and offer global distribution capabilities with distribution centers throughout the United States and in Europe. The experience and knowledge gained from manufacturing these products on-site allows us to better adapt to market demands and provide flexibility and quick response to ever-changing customer requirements. In addition, helping us to compete in today’s global market, we have quality manufacturing partners overseas as well. In order to maintain an industry leadership position over the course of 65-plus years, it takes much more than just world-class manufacturing. Superior truly differentiates itself from the competition when it comes to delivering the highest quality products on time, while remaining on the cutting edge of innovation to bring better products to market faster. To aid in achieving this, Notrax® places a great deal of emphasis on product engineering, research & development and customer service. With in-house engineering capabilities that include an on-site chemist and a product testing lab, Notrax® is unique in our commitment to quality and continual improvement. An additional piece to this puzzle is our on-going involvement in the ISO certification program. The ISO 9000 Series was developed by the International Organization of Standards and serves as the leading quality assurance system for world-class companies in over 90 countries, while the objective of ISO 14001 is to identify the environmental "aspects" and continually work to minimize negative effects of operation. Notrax’s objective is to provide customers with total product satisfaction and unparalleled service and support. The attainment of ISO 9001 at our Georgia Division, and ISO 14001 and 9001 at our Mississippi Division, coupled with Notrax’s emphasis on training, education, and participation in the growth of the organization by our employees underscores that commitment. In addition, Notrax® has long-standing relationships with key customers and distribution channels in a variety of markets and has garnered numerous vendor and preferred supplier awards over the years. It is our commitment to quality and service that has become the cornerstone of these relationships and reinforces our strength as a supplier. Why do I need an entrance mat?